Vitamin C, also known as ascorbic acid, is a water-soluble vitamin found in many types of fruits and vegetables, especially citrus fruits like oranges and lemons. Health supplements containing vitamin C are used to treat a wide variety of conditions, ranging from the common cold to heart disease. The reasons for the health benefits result from several different mechanisms of vitamin C within your body. 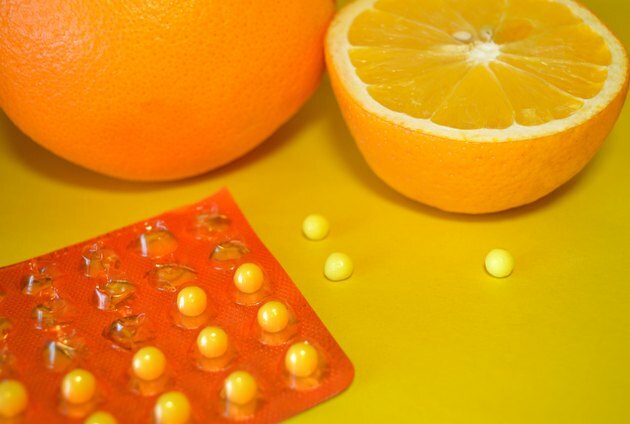 As with any health supplement, you should consult your doctor before taking vitamin C.
Vitamin C has potent antioxidant properties, meaning it is able to reduce damage caused by oxidizing chemicals, such as free radicals. These oxidizing chemicals, sometimes called reactive oxygen species, or ROS, are the normal byproducts of the cellular reactions that take place inside your body. Oxidizing agents are very unstable and damage your cells by reacting with important molecules and changing how they function. Vitamin C reduces this damage by directly binding to oxidizing chemicals and converting them to less harmful molecules. Reducing oxidative damage can have many benefits for your body, including reducing cancer and heart disease. Another benefit of vitamin C relates to its involvement in synthesizing collagen. Collagen is one of the most abundant proteins in your body and is a major component of skin, teeth, cartilage, bones, tendons, blood vessels, heart valves and many other tissues. In your body, the enzymes that drive the biochemical reactions that synthesize collagen require vitamin C in order to function properly. When your body does not have enough vitamin C, it cannot make enough collagen and the tissues that are made of collagen start to break down. This breakdown causes many problems for your body, such as the inability to heal quickly from wounds. Vitamin C also plays a major role in regulating your immune system. Many types of immune cells are stimulated by vitamin C, including white blood cells. These white blood cells help your body fight infection by attacking and killing viruses and bacteria. Vitamin C may also increase levels of antibodies in your body, which are another defense mechanism your immune system uses to attack invading microbes. Your body needs vitamin C to make several other types of important chemicals. One example is a critical neurotransmitter called norepinephrine that is required for the proper functioning of your brain and plays a role in regulating moods. Another example is a chemical called carnitine that helps to transport fuel molecules into muscle cells where they can be used to produce energy. Vitamin C is also required for your liver to break down cholesterol and remove it from your blood stream.